Sources say the fitter, leaner BJP chief has been advising his party colleagues to follow his strict regimen, but not many have been able to keep up. New Delhi: BJP leaders are used to taking political cues from party president Amit Shah. But now, they’re getting weight-loss advice from him as well – after all, without the ‘magic’ of bariatric surgery, and through completely natural means, Shah has managed to lose about 20 kg. 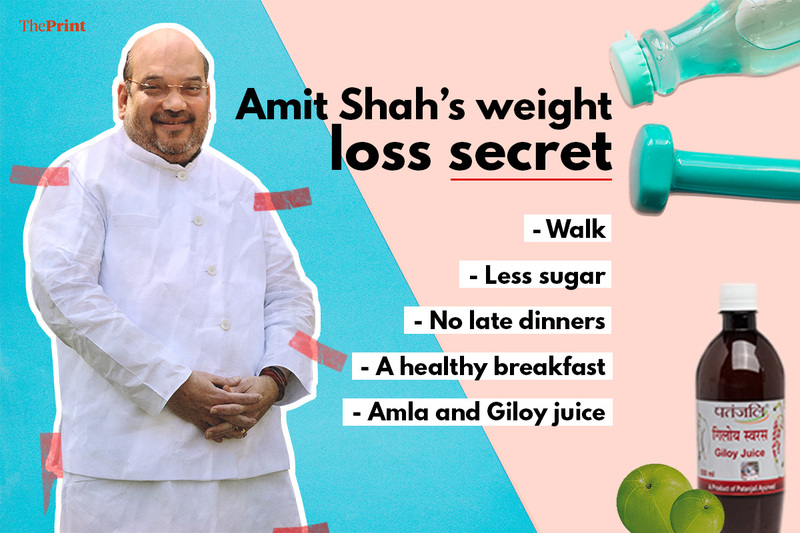 The fitter, leaner Shah is often heard advising his colleagues to take good care of their health, according to highly-placed sources in the BJP. But very few have so far taken his advice on this front seriously, preferring merely to smile and nod their heads. The few who have followed his path are finding it difficult to keep up, because Shah has drawn up a tough regimen for himself. Sources say Shah suffers from diabetes, and for years, many advised him to reduce his weight. Some say Baba Ramdev even tried to teach him a few yoga asanas. But the BJP president only began focusing on getting fit about a year ago, and decided to drastically alter his lifestyle. 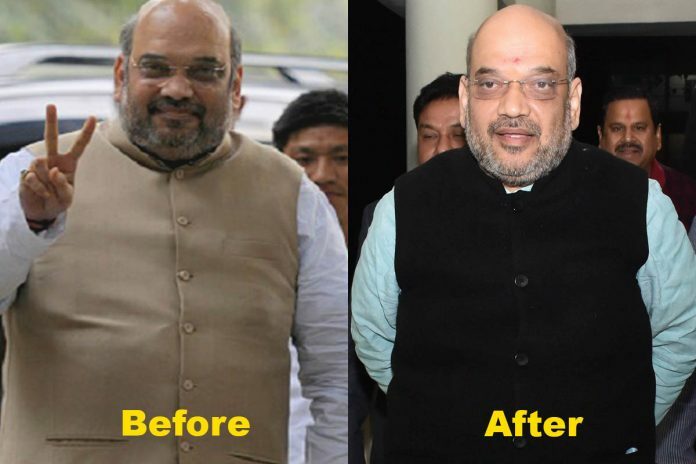 Now, even during election season when he keeps a busy schedule, Shah is able to at least maintain his weight. One decision that helped Shah was to stop having dinner after 7.30 pm. He is said to believe that late night dinners are responsible for gaining weight, and should be avoided at any cost. Step two is a healthy, hearty breakfast. Unlike many who suggest that rice and wheat should not be eaten together in any form, Shah does not mind the combination. He has, however, reduced his sugar intake drastically. Sources said he starts his mornings with Patanjali’s giloy-amla juice, and then, without fail, goes for a morning walk. “Wherever he might be, he ensures he sticks to his morning walk. If that’s not possible for some reason, like if he’s campaigning or something, he will find a way to burn the calories,” a source said. Shah also tries to stick to his diet routine. A senior minister once said that he travels with food in his vehicle, and if he knows he will be delayed on the campaign trail, he eats and then gets back to work. Kudos, Amit bhai! Wish others could follow your initiative! Bravo once again! Non sense. We are not interested in his weight loss secret. We are interested in his son’s business secret. It is nice that the architect of BJP victory is keeping his health in a perfectly trim condition. He has still missions to complete and let us ignore those morons who see evil in anything connected with BJP since they have polluted mind with a polluted DNA. He could start with unloading the burden on his conscience. Burden of all the wrongs he’s accused of from days of Gujarat riots, the burden of his monopolistic practices in cooperative banks, the stalking of adults in Gujarat, the mysterious death of the judge. A mixture of rice, roti and remorse is a better diet – first thing in the morning, even better. Also he needs to drop Revenge from his consumption – cutting sugar might not be enough. Good Hindus face their Karma as they approach Vanaprasthrashram. Good Indians do a lot more, but let’s be conservative in our expectations. The burden of all those court cases – it ll show up on weight scales. Not vamooze with the 20 kg fat. criminal because you think so? That way, I would say you are a criminal. For a minute, I thought I am reading Times of India….